1967 – 1971 the 3rd generation of the MOPP TOPS began. 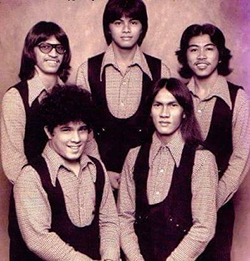 Noted for their unique showmanship, arrangements, funky apparel, they played at just about every venue you could imagine. . .Including the “Diamond Head Crater Festivals” . Barred from competing in any battle of the bands – they would appear as special guests. Their homebase became the hottest college bar in town “The Blue Goose”.